On the sun's revolving splendour. Sunflowers (Helianthus annuus) are an annual plant native to the Americas that possess a large inflorescence (flowering head). The sunflower got its name from its huge, fiery blooms, whose shape and image is often used to depict the sun. The sunflower has a rough, hairy stem, broad, coarsely toothed, rough leaves and circular heads of flowers. The heads consist of 1,000-2,000 individual flowers joined together by a receptacle base. 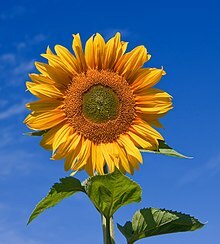 From the Americas, sunflower seeds were brought to Europe in the 16th century, where, along with sunflower oil, they became a widespread cooking ingredient. Sunflower leaves can be used as cattle feed, while the stems contain a fibre which may be used in paper production. Pedro Calderón de la Barca, Magico Prodigioso (1637), scene 3. Shelley's translation. Points her enamoured bosom to his ray. James Thomson, The Seasons, Summer (1727), line 216. Quotes reported in Hoyt's New Cyclopedia Of Practical Quotations (1922), p. 768-69. Abraham Cowley, Of Plants, Book IV. Of Flowers. The Poppy, line 102. Erasmus Darwin, Loves of the Plants, Canto I, line 225. Caroline Gilman, To the Ursulines. Thomas Moore, Believe Me, if all Those Endearing Young Charms.